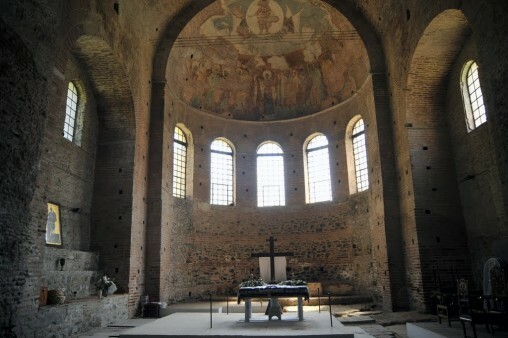 The Rotunda Church in Thessaloniki, northern Greece, also known as the Church of Agios Georgios, is again visitable since last week, freed from the scaffolding and restored. The church has remained closed for a year due to restoration works and the installation of a new lighting system. The 4th-century monument is included on the UNESCO World Heritage List since 1988. The Rotunda was built by the Roman emperor Galerius (305-311) as part of a large palace complex in Thessaloniki. The Rotunda has gone through multiple periods of use and modification as a polytheist temple, a Christian basilica, a Muslim mosque, and again a Christian church (and archaeological site). The Rotunda is the oldest of Thessaloniki’s churches. In 1978 the structure was damaged during an earthquake but was subsequently restored.